These pancakes are awesome. 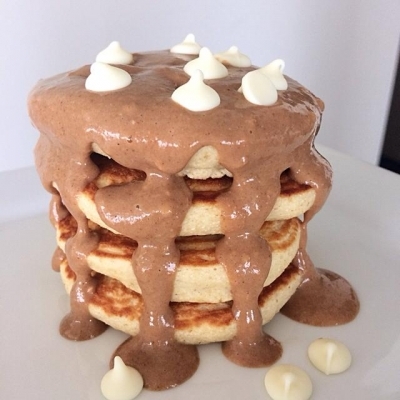 You need to try them and I promise even if you always failed with pancakes you will succeed with these and love the moist, thick, gentle texture. Recipe: blend 3 egg whites, 2 tbsp plain greek yogurt, 1/3 of a SMALL banana, 1/2 tsp baking powder, 1/4 cup of oats and 2 tbsp of coconut flour. No sweetener. You will get quite a thick texture. Spoon it on the preheated pan and cover with the lid. Its a must step for thick pancakes. Then cook on medium heat on both sides. For the topping i mixed 1 tbsp of chocolate pb2 with almond milk.